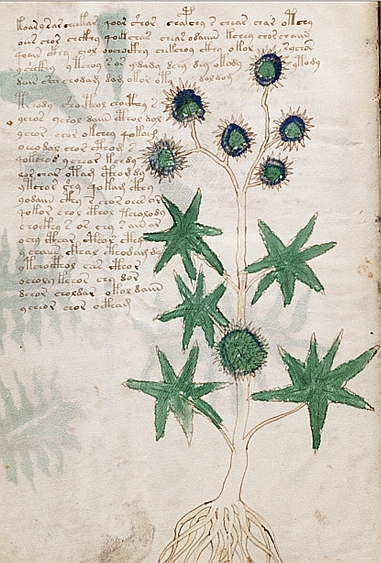 Voynich f6v: Ricinus communis, the Castor Oil plant? In this full and detailed post I will discuss page f6v of the Voynich manuscript (VM), following the analytical approach and provisional findings which I set out in my Feb 2014 paper. In summary, I will propose here that the plant depicted on that page can be identified with some confidence as Ricinus communis, also known as the Castor Oil plant, on the basis of analysis by a number of biologists. I will then offer evidence that the first word of that page, transcribed in the EVA transcription system as KOAR, can be read as ‘K A W R’ or similar, and possibly represents the name of the plant, perhaps deriving ultimately from the Arabic name for Ricinus communis, /xarwaʕ/, roughly Kharwa’. I will then suggest that as such, it is consistent with, and supports, the analytical framework I set out in that earlier paper, and therefore represents a small but valuable step in the decoding. I will follow the approach set out in my Feb 2014 paper: in Step 1 I first examine the Voynich illustration in comparison with mediaeval depictions and in the light of other, independent, scholars’ analysis of the illustration, so as to to examine the case for the identification. In Step 2 I then turn to discuss the possible plant name in relation to the first word of the Voynich page, drawing on mediaeval names for the plant in different languages. However, before the discussion itself I want to acknowledge the contribution of the person who prepared a lot of the groundwork for this analysis and stimulated me to pursue it. During this exchange with Shaun, his analysis struck me as professional and plausible. I knew that the plant had been identified previously as Ricinus communis, as Shaun noted, and I had also wondered fleetingly about the first word. Shaun’s message set me off researching it in detail, for which I’m grateful. I was also gratified that someone else had been able to follow the procedure proposed in my paper, and had made use also of the signs I had provisionally identified in a way which seemed to support my analysis. After further research I now believe that Shaun (and his brother) have indeed made a potentially significant contribution – though of course the analysis must still be considered provisional and partial while we build up more evidence. Let me now offer the analysis in full, fleshing out what Shaun has suggested with further evidence and discussion. As Shaun noted, a number of Voynich scholars have identified this plant as Ricinus communis, including Peterson, and Ethel Voynich, supported also by Velinska. Recently another biologist from Finland (who wishes to remain anonymous) has also supported this identification. The historical evidence also seems compelling, as we can see when we can compare the Voynich picture (below left) with the picture produced in around 1500 probably by Robinet Testard. In this illustration we see (assuming aspects of ‘zooming’ on the part of the artist) “a representation of a rather stout plant with palmate leaves (i.e. lobes radiating from a single center) and with big, round, spiky fruits”, to quote the Finnish biologist. Even the colour appears similar to the Testard illustration. The caption at the bottom reads: “Les feuilles sont palmées, denticulées et nous observons également un pétiole allongé qui s’insère à la base, un peu à l’arrière du limbe. Nous notons 7 dents par limbe dans les deux cas (la plante et sa représentation dans le manuscrit).” ( “The leaves are palmate, serrated and we also observe an elongated petiole joining the leaf at its base, a little behind the leaf edge. We note 7 teeth per blade in both cases, i.e. 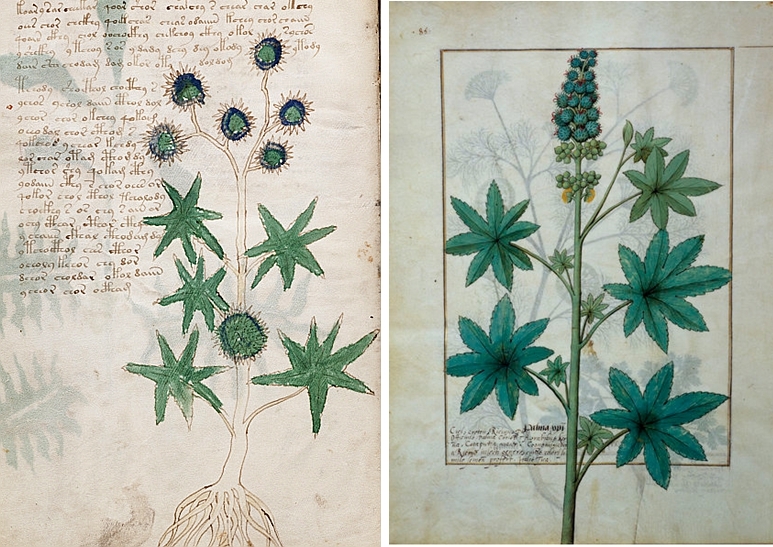 in both the plant and its representation in the manuscript”). 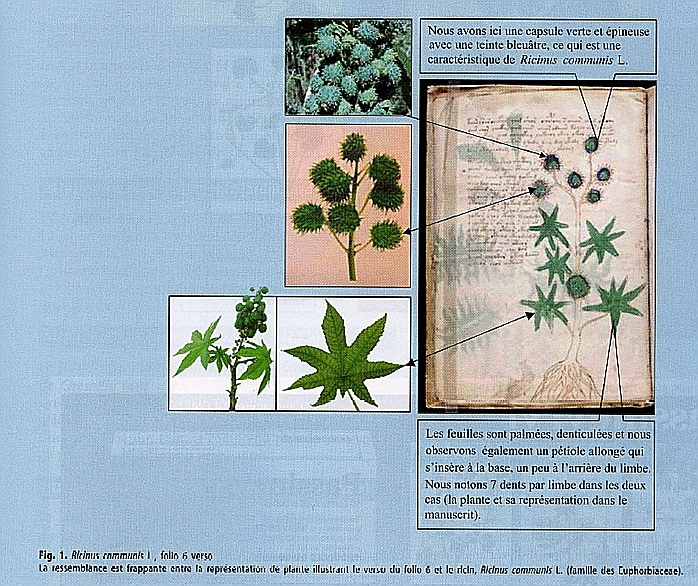 It is difficult on the basis of this accumulation of evidence and detailed analysis, from these authors and other plant specialists, to disagree with their conclusion as expressed below the illustration, that “La ressemblance est frappante entre la représentation de plante illustrant le verso du folio 6 et le ricin, Ricinus communis L (famille des Euphorbiaceae).” (“The resemblance between the plant illustrated in folio 6v and ricin, Ricinus communis L ( Euphorbiaceae family) is striking”). 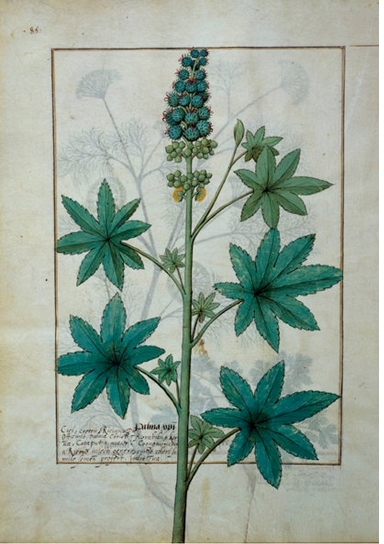 In summary, the evidence therefore seems to me compelling that the Voynich plant can be identified with some confidence as Ricinus communis, the castor plant, used for centuries and still in use today for a variety of medicinal uses. -The first letter is the the guttural /x/ sound as in the Scottish word ‘loch’. -The second letter is the consonant /r/. -The short vowel between the two (approximately /ə/ or /i/) is usually omitted in unvowelled writing, in a way typical of ‘abjab’ scripts, and must be supplied by the reader from memory. -The third letter is known as ‘waw’ and can either be a long vowel similar to ‘oo’, or can be a /w/ sound. Here it is read as the latter, and the reader must also supply a following /a/ vowel. -The final letter is the throaty guttural consonant known as ‘ayn’ (ʕ) which does not exist in most European languages. (It is the same sound as I mentioned in my Feb 2014 paper as the start of the word transcribed as ‘arar’, juniper). When Arabic words containing this sound are borrowed into other languages, including even the word ‘Arabic’ itself, this sound is often written as ‘a’, or omitted. “In the proverbial language of the Indians the Castor plant is emblematic of frailty; they say:—Naukri a rand ki jar hai (service is like the root of the Castor plant). The Arabs appear to have first become acquainted with the tree in India, as they call the seeds Simsim-el-hindi, “Indian Sesamum,” and the plant Khirvaa [Dymock insertes the Arabic word ‘Kharwa’ here] , a word which signifies any weak or frail plant; the properties they attribute to it are also those mentioned by Sanskrit writers. Again, in the Saptasaaka of Hála, we find the large and swelling breasts of the peasant girl likened to the Eranda leaf, and in Arabic we have the expression [Dymock inserts the phrase ‘imra’at kharw’a’ here, meaning ‘fragile girl’] applied to a beautiful and tender girl. Dymock goes on to note that Herodotus called the plant ‘Kiki’, Theophrastus called it ‘Kroton’, it is mentioned in Pliny, and in Hebrew it is ‘kikajon’. It is noteworthy that Dymock himself, even though he inserted the correct Arabic script into his text, transcribed it wrongly as ‘Khirvaa’, transmuting the original Arabic ‘waw’ (/w/)into a /v/, and the final ‘ayin’ as the long vowels ‘aa’. This was probably because he was reading it through an Indian/Persian prism, and this demonstrates how easily the original consonants could be altered. Below that, Dymock also mentions an alternative name, “Gerchak“. This probably derives from the Persian ‘kerchak’ ( كرچك ) (Urn, T and T.Kwee Lim 2012:487), which is probably the source for the similar modern Armenian word Gerch’ak (Գերչակ). All of these most probably derive in part from the initial element of the Arabic word, the ‘Khir’ transforming to ‘Ker’ and ‘Ger’, with the addition of a Persian suffix ‘chak’ – although I am not aware of what this suffix might mean. In other words, it appears that we have on this page a convincing identification of the plant illustrated, and an historically and linguistically plausible identification of the first word of that page as a credible name for that plant, which would appear to derive, as in the case of a number of other languages, from the original Arabic name. In summary, it is suggested that the plant on this page can be confidently identified as Ricinus communis. It is then provisionally proposed that the the first word of that same page could well be the plant name, and that it can be tentatively read, using the signs I identified previously, as /kawar/ or /k a ə r/ consistent with the well-known and widely diffused Arabic plant name for Ricinus communis. In more informal terms – this longer analysis seem to support in full the analysis offered by Shaun King in his original correspondence, and once again I am grateful to him for his work. Of course, despite the evidence given here, and as with all the plant identifications made in my Feb 2014 paper, this analysis on its own must be considered speculative. However, when taken together with the other analyses offered in that earlier paper, it appears both to fit well with the readings offered for other letters and words in the Voynich manuscript, and also to support the analytical scheme and its tentative identifications. In short, it appears to be another small but positive step in the long road towards decoding and deciphering the script and language of the Voynich manuscript as a whole. Hi, I am 23 years old and i am vet student. I was studying veterinary toxicology and I found this manuscript by chance. I dont know a lot of plants, only some toxic for animals. But when I saw the picture of F6V I automatically identified it like Ricinus communis. So searching in google I found this website. I think that if someone with no too much experience in plants has automatically identified it in a few seconds its not a coincidence, thats Ricinus communis. I look forward to decipher the mystery of the Voynich manuscript. I hope you can do it. Also i want to know more so if you can inform to me about VM news i would be very thankful. Best wishes from Málaga, Spain. I understand that Petersen may have been the first to make this identification, accepted by Ethel Voynich (or vice versa), and then followed in turn by numerous other researchers, among whom .. I seem to recall… Dana Scott (I think) precedes Edith Sherwood etc. etc. I came comparatively late, and made the identification independently, but needn’t have troubled if the history of Voynich research weren’t so obscure. I’m quite sure that Ellie Velinska would agree that she merely accepted all the previous concensus – because I recall her commenting, as a person newly arrived, on the post where I made the identification, and then added a note crediting Petersen et.al. as precedent. This folio is one of the very, very few where a number of people have quite independently come to the same conclusion. I’d say it can be taken as read. Another is folio 9v, which refers to the Viola(s). Generally, though, there is no consensus, or where we have consensus, it is rarely a matter of separate, independent, opinions. Cardoon , its a weed in the mediterranean, the leaves don’t match exactly but let’s be honest this guy was no davinci and most of the pictures focus on the roots of the plants not so much the flowers and leaves. In fact maybe you should look into that since many plant roots are used for medicinal purposes maybe its not so much about the plant as it is it’s uses. Vellinksa did me the kindness of reading my old botanical blog, in which I’d come to the same conclusion. Naturally, when she reached the same decision as Petersen first had, it was an independent choice, as was the case for me. I agree with the id as Ricinus communis. If it is of any help I would, however, mention that the plant drawn is quite aberrant: the inflorescence drawn is branched in contrast to the plants I have seen (and to the illustration in the other herbal cited), in the VM one fruit is drawn in the middle of the stem whereas in reality the flowers are restricted to one inflorescence at the top. This discrepancy can in my view come from two sources: either the image is copied from an earlier source (whereas a young shoot with one small leave has been mistakenly painted as fruit) or the plant depicted was actually used and an earlier inflorescene was cut away entirely and the plant depicted produced two new branches at the base of this cutting, this may also explain the production of a small flowering shoot further down (I have not seen such a plant myself but in principle this could be possible). If the source of the material in the manuscript came from the Latin European tradition, your remarks would be perfectly right. However, it is fairly evident that we are dealing with a different culture and way of thinking and of classifying plants. When people know their plants very well, they do not need “photographic” realism, but only images which recall the salient points for their own purpose. It is noticeable that in Europe, the growth in extremely literal botanical imagery increases as more and more people who have no prior knowledge (not farmers, for example) need to be taught what the plants look like. This also because more and more plants were arriving which were never in Europe before. I do not believe that the Voynich plants are any form of Latin herbal, and it is interesting to find that after having explained them otherwise for quite some time, that the languages which Professor Bax thinks he reads here are not European languages, either. It would be interesting if it were a kind of pharmaceutical-botanical dictionary like SImon of Genoa’s Synonyma, wouldn’t it? I must say I’m hoping it will turn out to be a sort of Judeo-Persian, but time will tell. I fully agree with you that this depiction is not at all photographically realistic. I am no expert on the traditions of depicting plants. If we do want to find labels for plants, however, I would strongly argue that we build a sound basis on those that are unmistakebly identifiable. My suggestion, therefore, wold be to start with those that are drawn photographically realistic, although, as you rightly pointed out, there not that many in the MS. The problem with the plant names is that there are many vernacular names for those and it will probably take a very lucky find/guess/inspiration/whatever to get the first good label (the ones so far are still speculative in my mind, lacking the unmistakable identification of the plant). For the star labels, however, the problem is quite the opposite, the majority of stars that are most likely shown (i.e., as seen from the Northern Hemisphere) have been named for the first time in the Arabic world and the names for most of them have been loaned to other languages. So we need to be cautious with a possible bias for provenancing the MS based on the star labels alone. At last, is the MS not generally conceived to be more or less in the western tradition? See this interesting illustration of the Castor Oil Plant here, second picture, at the bottom, which fits well with the discussion above. Thanks for including this picture of the castor oil plant. I tend to, when researching stuff (and I am not a scientist, just a regular person! 😉 ) , view things with an open mind, and not from a standpoint that we know everything. First and foremost, plants look very different when wild, or cultivated…and this may contain only local wild herbs that are beneficial. The feeling I get is that it is a sort of 14th century survivalist guide. Thanks for your time and energy that you have put into this translation of something that at one time writer put a huge time in writing and drawing. Ps. I am an artist, and I think though the writing looks “adult” the drawings are somewhat “childlike” but I think they are more curious as in, it is a style…and I really like it. I am sure with descriptions so fully written out, and understood that the plants may have a true resemblance to what the author/ artist was looking at. Some very nice work you have done….